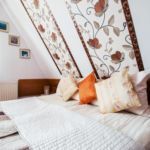 Rooms, services 15 comfortably furnished rooms are offered by Chata Pod Jemiołą Zakopane to guests looking for accommodation in Zakopane. The villa offers chield-friendly services during your stay, would be therefore pleased to host the entire family. The villa provides a parking space for you without charging any additional costs. In case you'd bring your laptop along, you may go online via wireless Internet connection (WiFi) available at the villa. 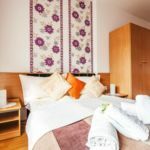 You can find the exact list of services provided by Chata Pod Jemiołą Zakopane (including those for extra fees) and the exact equipment of the rooms on the information sheet below and on the information sheet of the respective rooms. Catering The displayed room prices include daily served, fresh and rich breakfast. You may also select half board as the preferred type of catering, which you can indicate when making the reservation. Payment When paying your room, you may choose from the following payment methods: cash, bank transfer, credit card. To confirm your reservation Chata Pod Jemiołą Zakopane is asking you to pay 30% in advance. Arrival, opening hours The earliest time to check in at the villa is 16:00, the latest time to check out is 10:00. You will be able to speak with the personnel in Polish and German languages. 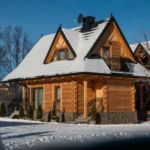 The rating of Chata Pod Jemiołą Zakopane is 9.6 from the maximum 10, 56 based on actual and valid guest ratings and reviews. Based on the reviews and comments of actual guests, the services of the Chata Pod Jemiołą Zakopane have received a high rating of 9.7/10.